"sometimes, even the east river can look pretty" was going to be my comment for the day. but then after coming home and actually looking at the photos i took this afternoon, i realized that maybe it wasn't so much that the river looked nice, but probably just the fact that i was basking in the sun eating ice cream as i was looking at it. i've been called 'sassy' a few times before, so i wonder what exactly it is about this lettuce that makes it so sassy. in a side note regarding the supermarket, my latest gripe is that the cashiers, or at least the cashiers at our local key food, just don't understand the concept of reusable bags. i don't carry my own bag because i want to bag my own groceries. i carry them because they hold more and are easier to manage, lugging everything home on my shoulder, than in my hands in a pile of small bags.and of course for unselfish reasons, they are good for the environment. so i find it rather unfair that the minute i pull out my bags and put them on the counter, the cashier automatically thinks his/her job is done and they don't have to bag up my items while i pay for them, and instead they turn and chat with their buddy at the next register. or just stare into space, as the woman did earlier today. when i refuse your plastic bags, i am not absolving you from bagging my purchases. one thing i definitely did not expect to find in the park today was a knitted squid. at least, i think this is a squid. he was hanging out on the bench to the left of mine the entire time i was in the park this afternoon. interestingly, he didn't receive too many strange glances as people walked by. however i did, once i decided to have a photo shoot with him. i explored the neighborhood of Forest Hills today, something i've been meaning to do for awhile now. it was a bit of a damper that we did this on the one day this week that it rained, but the area was still super cute and i got awesome mexican for lunch and got to hang out with an extremely friendly cat named Boo, so all-in-all it was a rather nice day. today i discovered the series THS Investigates - specifically, the episode entitled THS Investigates: Dating Nightmares. a 2-hour in-depth, investigative report on the 'pitfalls' of dating - you know, internet predators, stalkers, abusers, people who will knowingly transmit communicable diseases to others. really joyous stuff. while at first mocking it to missy when i saw it on our channel guide, i of course then got suckered into the drama. pretty compelling stuff, although i suppose i wasn't taking away the proper life lessons i was supposed to...since i fell asleep halfway through it. thank goodness i'm not a 14-year-old with a penchant for chat rooms! i spent this afternoon baking muffins - pumpkin carrot muffins - which are "loaded with antioxidants" and supposedly a good boost for the immune system. i despise carrots, so i hope that by disguising them in a baked good, i can gain the nutritional benefits without that gross carrot taste. lord knows my immune system needs a boost. it needs a giant explosion, really, but we'll just start with the carrots and see how things go. sick - AGAIN - and unable to handle regular posting duties. sigh. thank goodness that tall bottle contains codeine - opiates make everything more tolerable. we're getting dangerously close to day 100, aren't we? i'm thinking i should throw a party or something. but i digress. so this interesting little vehicle appeared next to me on the highway earlier today. the picture doesn't do it justice, but it was about the size of a bumper car and had an unfamiliar license plate. one benefit to unemployment: being able to be one of the first patrons at the bar on St. Patrick's Day, thereby receiving free promotional Guinness t-shirts. in my ongoing quest to develop some sort of immunity to scary things - horror movies, haunted houses, my parents' basement - i forced myself to watch something from the scary movie genre last night (this morning). by immunity i mean the ability to go into the haunted mansion at disney world without my heart rate rising - i figure if i pepper in a frightening flick here and there, at some point in my 30's i can probably manage to partake in outings to the latest thriller release/sit in an empty house without fretting about what may emerge from the closet/attic/any other dark room. i love doing behavioral therapy on myself. 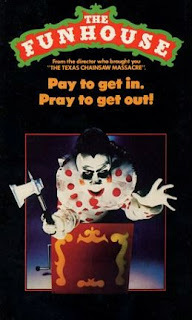 last night's flick was The Funhouse, an early 80's romp through a creepy small-town carnival. considering i watched it in the dark AND was able to fall asleep about 10 minutes after it was over, i imagine on the 'scary scale' this movie falls in the realm of kittens and unicorns. well, i do have some, but none of them are nice. and mixing up mango mojitos. have no fear - the above were not consumed together. we're gluttonous but not that gross. one of loveandcyanide's most favorite beverages on earth is pizzeria fruit punch. pizzeria fruit punch is so much more than regular old fruit punch - which is why we insist on referring to it as 'pizzeria fruit punch' - it's insane. as much as i like kool-aid and all of its ilk, none of them can compare to PFP. whenever missy and i find ourselves in a classic pizza place that has one of those little punch machines behind the counter, we glance at each other, gleefully, and then order up a cup to drink while we're waiting for our food. seriously, it's like the nectar of the gods. i don't know if it's because it brings back fond childhood memories - we did grow up in brooklyn. and old-school brooklyn, not the "brooklyn" of today. so i do have probably more fond memories than most of pizza institutions - or because it's such a nice, vibrant shade of red, or just the perfect mix of sugar and fake fruit flavoring, but it's marvelous. and magical. and can make any day better. it's thrilling to be able to sleep with the windows open the past few days. without freezing, i mean. now if only the sun would come out i'd finally have some decent 'play in the park whilst everyone else has to work' weather. i was initially a little afraid of them as well, but they have the consistency of a Now and Later, just covered in chocolate. chocolate-y, pineapple-y goodness. i so wish these were a gift from a local candy store and not from a friend who just returned from New Zealand. 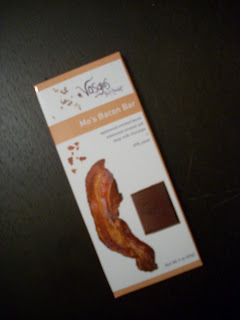 i need to figure out how to find these precious little gems without flying to the other side of the world. a kiwi hand puppet, and a copy of stepbrothers. brooklyn, as seen through an excessively dirty ferry window. i spent part of my afternoon today (well, yesterday. i'm constantly behind now with this little project of mine....i blame it on my lack of a camera on my phone) at the good old Department of Motor Vehicles, renewing my license. i am quite sad - i'm pretty certain entirely too sad, considering this is just a laminated ID card - to see the old one go. its been through a lot with me during these past ten years. and it seems totally insane that it was ready to expire already - i can remember sitting there, at the age of 19, carefree and tan*, thinking to myself, "ew, i'm going to be TWENTY NINE the next time i have to get a new one of these**". and here i am, at the brink of 2-9, with my cruddy old license expiring. where do the decades go. *i was wise enough back then to take my license photo AFTER i came home from spring break, in the attempts of having color in my face so i wouldn't look like a ghost on my ID. no such luck this time around. **i suppose quite similar to me now, noticing that my new card will expire in '17, proclaiming "ugh, i am going to be THIRTY SEVEN". from the found objects file -- i came across this little doodle in the bag i was carrying today. given the bag is missy's, i would assume that it's hers. but she's not one to draw vehicles. i am currently obsessing over this new mcdonald's commercial. the first time i saw it last night - perhaps it's been on for awhile, but i rarely watch tv in "real time", so i don't catch many commercials - i hooted aloud with laughter. really, hooted. i've never done that before. snow day. i can't fully enjoy the fluffy white stuff since i was already moving into spring mode, and needing to put the boots back on just ruined it for me. SWOOOOOOOOONNN! it took me entirely too long to have one of these. totally worth the wait.